The Quest Super Cruiser Longboard by Quest longboards is a piece of gear that lives up to its name – an amazing way to glide around the city in style and class, while being eco-friendly and quick. One of the most popular longboards in the market, the Quest Super Cruiser longboard is known for being one of the best decks available. This is due to being affordable, stable, long-lasting and being truly high quality. For anyone looking for a great longboard for cruising that is affordable and eco-friendly, then the Quest Super Cruiser Longboard is a great choice. It is suited for both beginners and experienced riders due to it amazing features. They include stability, manoeuvrability, ease of control and being lightweight. 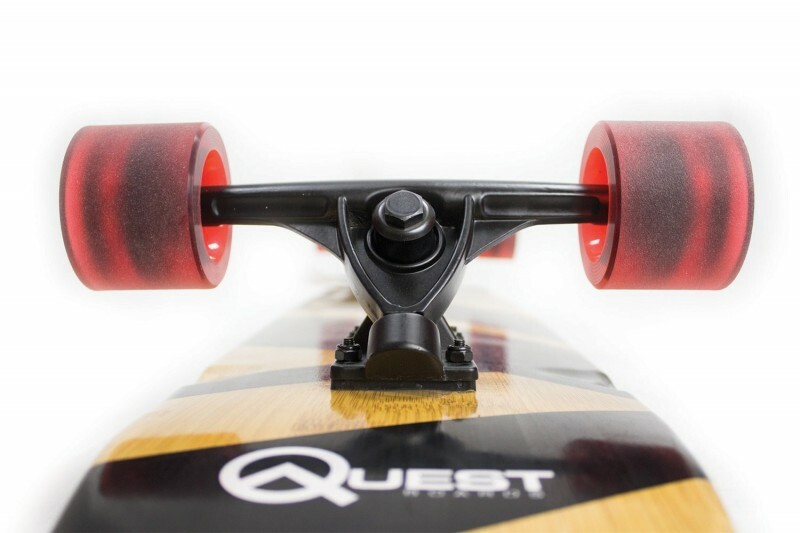 The Quest Super Cruiser is aesthetically pleasing and bound to turn heads. This is due to its eye catching fresh and beautiful Artisan design which is simply elegant. 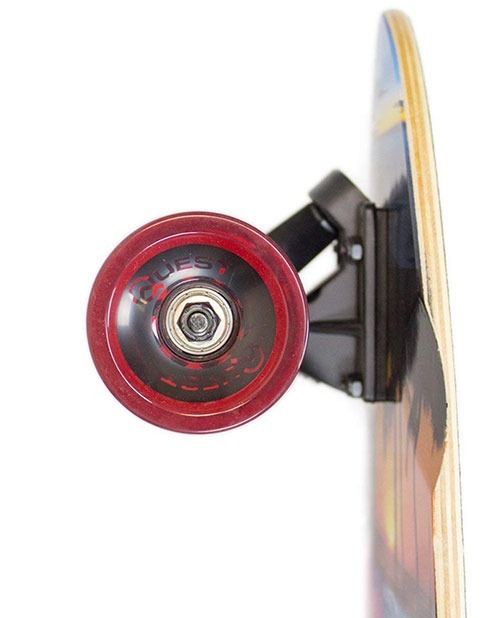 The Quest Super Cruiser measures 44 inches in length and weighs around 8.2 pounds. It is made of multi-ply Artisan super-flex bamboo and maple hardwood. For better wheel attachment and great all-around riding experience, the deck features wheel wells and a kicktail. It has 7-inch trucks made of aluminium and features Hollow 4mm risers. These connect to wheels with a diameter of 70mm made of polyurethane. 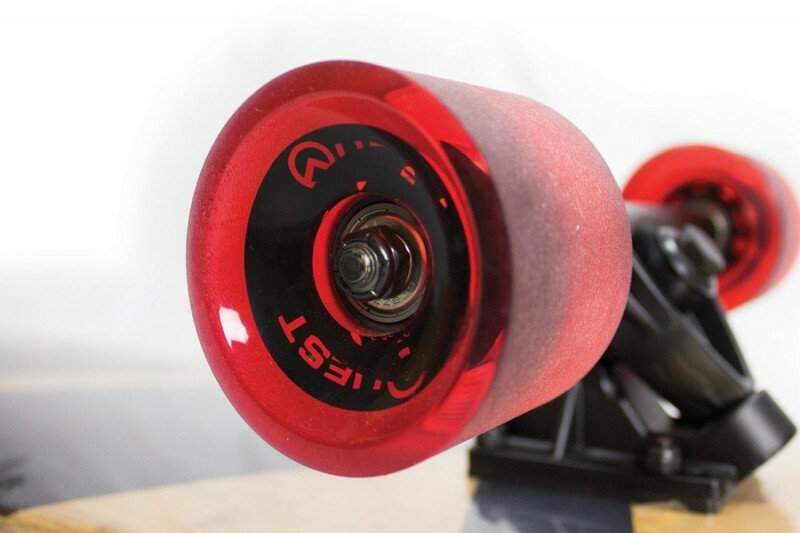 The wheels have an 80A durometer that are connected through Precision ABEC bearings to the trucks. This is a great board for cruising and commuting. It is also well-suited to beginners and those starting to learn freeriding. At 44 inches, it is big and tough enough to handle both small and big riders. Given it’s a large longboard, it may be counterintuitive to think that it is a great board for telecommuting. However, its light weight as well as large and hard wheels makes it amazing as a telecommuting board. The multi-ply deck combining maple and bamboo makes the board light. It is thus easy to accelerate and carry the board. It also gives the deck some flex, ensuring the board is well-suited to different riding surfaces. All these are important features for a cruising and telecommuting boards. 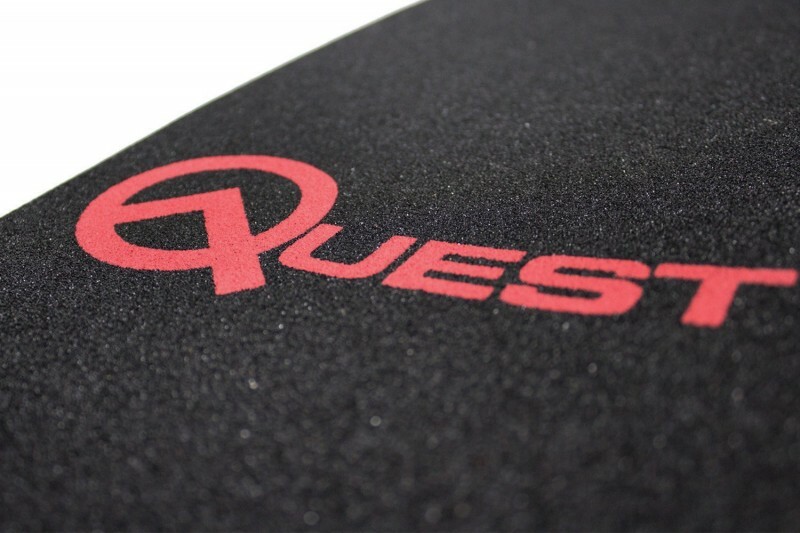 Their stylish design and great art designs make Quest Super Cruiser boards aesthetically appealing and eye-catching. 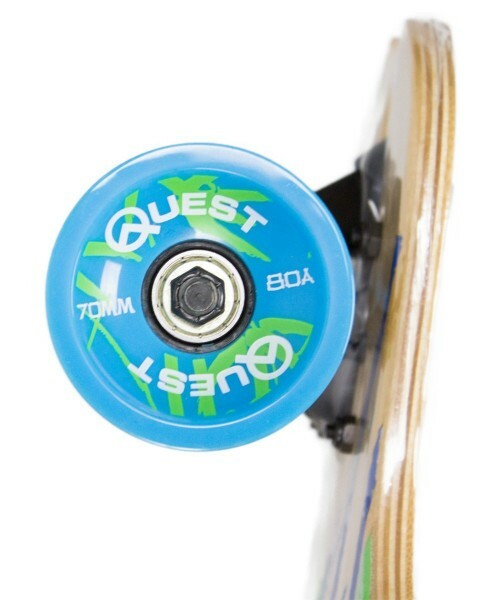 The Quest Super Cruiser Longboard is one of the boards suited to beginners that feature a kicktail. This makes it ideal for performing tricks and learning to freeride. Additionally, the kicktail enables a rider to make tight turns and manoeuvres making for an even more fun and steezy ride. Additionally, the kicktail makes the board more manoeuvrable, which comes in handy when a rider is cruising in a busy area or through a crowd. The wheel wells featured in the deck make it easy to mount the trucks and wheels. Combined with the 4mm risers, they prevent wheel bite, protecting the rider from wiping out after doing a trick or when turning. The 4mm risers also serve to add to the overall height of the board. This increases the board’s manoeuvrability without raising the centre of gravity too much as to stress a rider during cruising. They also serve to prolong the board’s lifespan as they absorb some of the shock the board encounters. The shock absorption feature of risers is also important in making the ride smoother. Since the board has large wheels, the risers are necessary so as to prevent wheel bite. The 70mm wheels with a durometer of 80A are medium-sized and pretty hard. This makes them ideal for cruising and commuting as they have the right mix of speed and acceleration. The board’s bearings increase precision when handling as well as smoothen the ride. All said, this is a great longboard for cruising and learning freeride well-suited to almost all types of riders. There are many reasons why the Quest Super Cruiser longboard is one of the best selling longboards in the market. It is one of the few boards that manage to meet all of the most important factors that make a longboard great. They are being cost-effective, of high quality, amazing riding experience, light weight, sturdy, durable, great design and aesthetic appeal and innovative technology. The deck, being made of maple and bamboo, is sturdy and durable. It is also lightweight, thus ideal for cruising and telecommuting as well as carrying around. The design of the board and its shape makes for a stable and comfortable ride. Various components that go into making the board such as risers and wheel wells ensures the board is easy to ride for both beginners and more experienced riders. The board’s versatile design makes it easy to manoeuvre. It is easy to handle and control while being forgiving to your knees and ankles. A kicktail means that once a beginner has learnt the ropes, they can use the board for freeriding. The art and design of the board is elegant and stylish, which makes it appealing to the eyes. Combined with the beautiful Artisan bamboo deck and abstract graphics, it is a great-looking board. For anyone interested in a great longboard for cruising or commuting, the Quest Super Cruiser Longboard is an obvious choice. Few other boards combine quality, style, great design and riding experience at a great price the way the Quest Super Cruiser Longboard does. This is one truly irresistible longboard perfect for almost everyone. 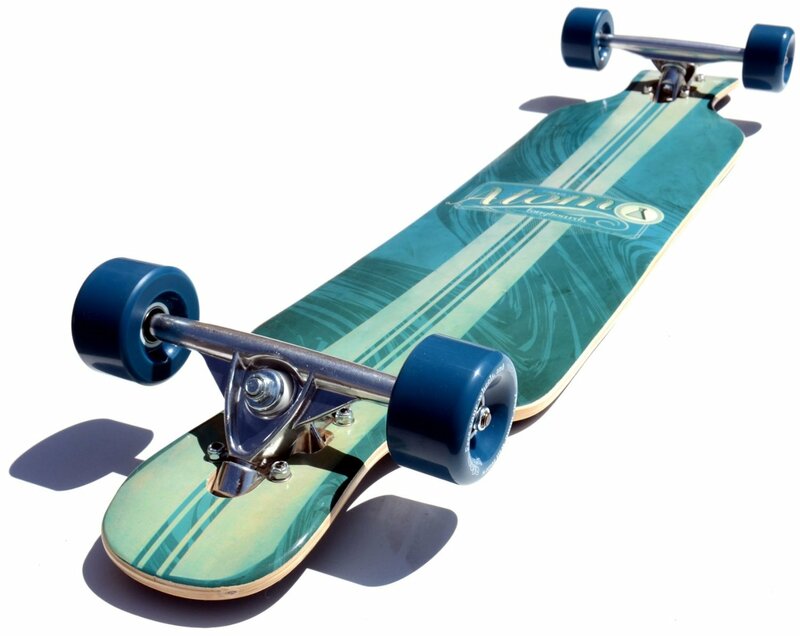 The Quest Classic Longboard features a 7-ply maple hardwood deck with a pintail shape. The board is extremely hardy and durable and comes with great graphics. It measures 40 inches in length, providing great stability and good manoeuvrability. The 7-inch trucks are made of aluminium. They are attached to 70mm polyurethane wheels through ABEC 5 bearings. This ensures that one doesn’t have to struggle when pushing to get rolling at a good pace. The bearing makes for smooth rolling and a comfortable ride. It is inexpensive and great for beginners. 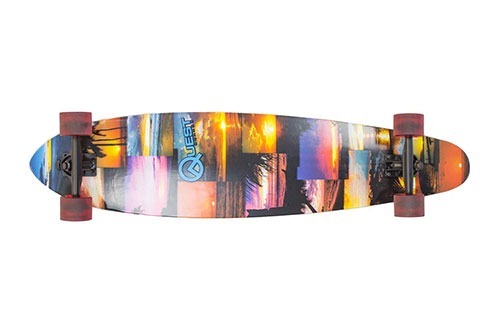 Quest Island Sunset Pintail Longboard measures 41 inches in length and is of super-flex Cold Climate maple hardwood. 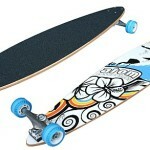 It has a pintail shape with a slight kick, making it easy to do tricks with it. This makes the board strong while still providing some flex. It also has wheel wells to prevent wheel bite. The deck spots graphics that are truly eye-catching and elegant. The deck sits on 7-inch reverse kingpin trucks made of aluminium. Hollow 4mm risers protect the board from tear and wear. They also serve to increase the maneuverability of the board as well as absorbing some of the shock. These are connected to 70mm diameter polyurethane wheels with a durometer of 80A. The wheels are to the trucks through Precision ABEC 7 bearings for better precision and control. All in all, this is a stable and easy to control board that is truly versatile and affordable. 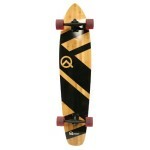 The Quest Bamboo Bomber Downhill Style Performance Longboard measures 41 inches in length. Its deck is made of 8-ply cold climate maple hardwood featuring an open wheel design. This makes the board strong enough for downhill riding and ensures one doesn’t have to worry about wheel bite. The deck is mounted on reverse kingpin 7-inch slot through aluminium trucks. These connect to the wheels through ABEC 7 bearings for great control and precision. The 70mm wheels have a durometer of 80A, making them ideal for bombing hills. Slot through trucks lower the centre of gravity for increased stability without compromising on easy of handling. The Quest Bamboo Bomber Downhill Style Performance Longboard is a great board for both experienced riders as well as beginners. It is great for cruising around and for commuting. It also performs exceedingly well while bombing hills and downhill riding. Not only does it excel in performance, it is also great looking. Combined with a great price, this is a truly great longboard for beginners as well as those interested in downhill riding.